Perfume history is being made at Louis Vuitton stores around the world, and to celebrate, Louis Vuitton Hawaii is connecting past and present at its Waikiki location in the Art Deco Gump’s Building, with a little assist from the Honolulu Museum of Art. On Sept. 1, 70 years after it had retired its small perfume line started in the 1920s, Louis Vuitton relaunched its fragrance program. As part of the milestone, Louis Vuitton Hawaii has borrowed four wood perfume bottles to display with the fragrances. From Sept. 15 to Oct. 14 you can be one of the first people to experience the seven new scents at Louis Vuitton Waikiki and see the vintage wood flacons. It is a homecoming for the handcarved works by Swiss artist Fritz Abplanalp, whom Gump’s hired and installed in an in-store studio for him to work in full view of customers. Ruff also happens to be an art collector and owns four Abplanalp sculptures and saw the wood bottles in the museum’s 2014 exhibition Art Deco Hawai‘i. In addition, Theresa Papanikolas, curator of European and American art (and of the Art Deco show), had shared with Ruff the book Lei in a Bottle: Collecting Hawaiian Perfume Bottles. “When I learned Louis Vuitton was relaunching its fragrance, knowing that Gump was the retail store that sold the first Hawaiian perfume, and that the museum had Abplanalp bottles in its collection, I thought this would be a great way for us to celebrate the milestone event,” says Ruff. Louis Vuitton has been working on its reentry into the fragrance market for more than three years. In 2013 the luxury firm purchased the 17th-century perfumery Le Fontaines Parfumées in perfume mecca Grasse, France, and hired fragrance rock star Jacques Cavallier Belletrud, the man behind such enduring perfumes as L’Eau d’Issey by Issey Miyake, Christian Dior’s Midnight Poison, and Giorgio Armani Aqua di Gio. To be a master perfumer, explains Ruff, you have to be able to identify 2,000 scents. That’s child’s play to Belletrud, who can identify 5,000 different fragrances. Louis Vuitton’s seven new scents are available at its Ala Moana and Waikiki locations. The seven new fragrances were a closely guarded secret. “We weren’t able to sample them until Aug. 24,” reveals Ruff. Just one week before the global launch at half of Louis Vuitton’s 460 stores. Louis Vuitton Honolulu Gump’s Building: 2200 Kalakaua Ave. at Lewers Street, 971-6880, us.louisvuitton.com. Open daily 10am-11pm. 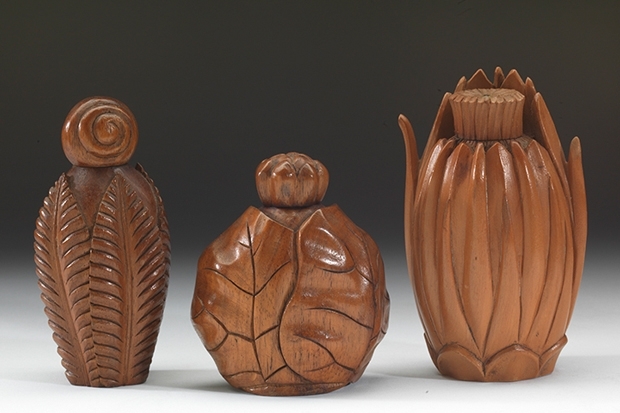 Fritz Albplanalp wood perfume bottles are on view Sept. 15–Oct. 14.